June 2016 - Proper Landscaping Inc.
June is a busy month for the European chafer beetles. I was thinking about it this past weekend as I finessed beds for a client. Instead of grubs, I was uncovering adult beetles. Some were spent and some just played dead, then made a run for it. European chafer beetles on a Hydrangea leaf. Only the top beetle is dead, the other three played dead and then made a run for it! The beetles mature and emerge out of the ground; most likely out of your damaged lawn. Then they fly into nearby trees to mate and back down to lay eggs. If you’re lucky, they invade your neighbour’s lawn. If you plan to defend your lawn with nematodes, pay attention to the timing. 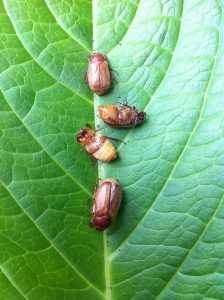 In late June the beetles lay eggs and by mid-July nematodes should be available. 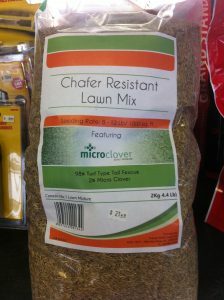 They must be applied to your well-watered lawn, preferably on a rainy day. 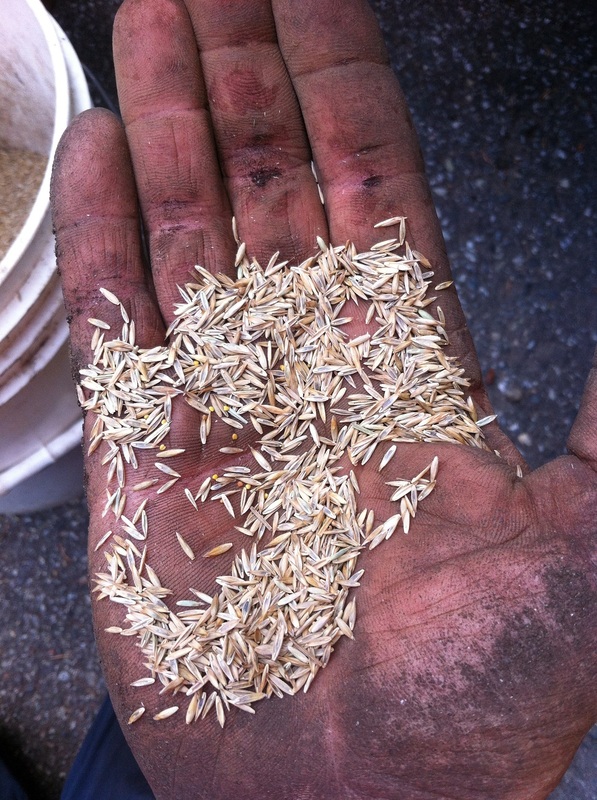 The recommended nematode species is the “seeker” Nemasys G. Nematodes work but they are not selective. They hunt down beneficial grubs as well. The other problem is that you might have to re-apply the nematodes again next year. Cut your lawn higher and baby it with proper watering and fertilizing. But what if you don’t feel like applying nematodes to your lawn? One alternative I have seen is breathable fabric used in agriculture. It makes it difficult for the beetles to stick their bottoms into your lawn and lay eggs. 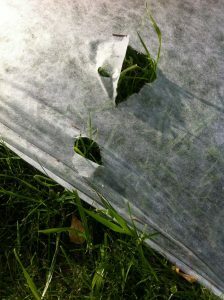 Pin the fabric to your lawn at this critical June stage, store it and re-use it next year. In the example below the fabric cost was around $250. 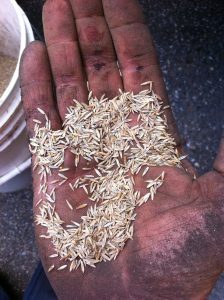 Another alternative is using a different seed mix that will make your grass less appetizing. 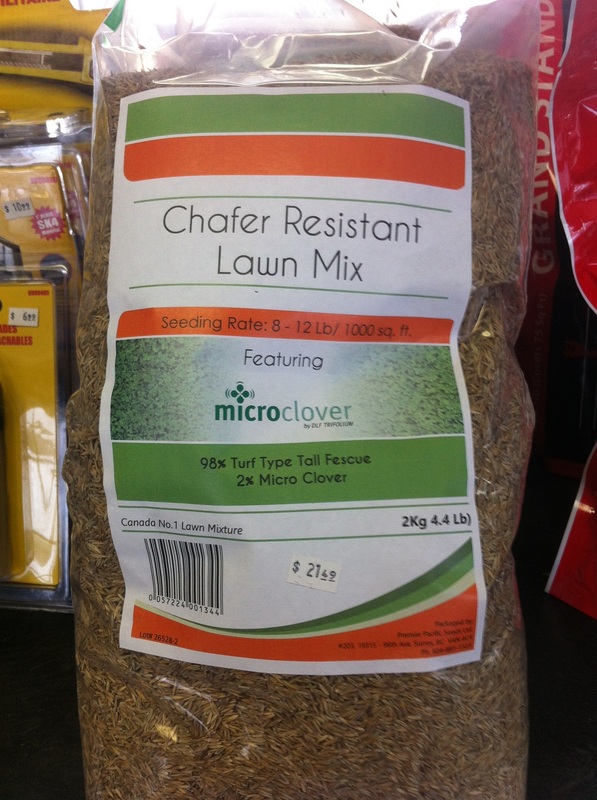 One test I am involved with involves “Chafer-resistant” seed mix with tall fescue grasses and 2% micro-clover. Warning: the micro-clover will produce white flowers and attract insects to your lawn. At $110+ for a big bag, it will also cost you. The European chafer beetle battles aren’t going away anytime soon but we can fight back with alternatives. This blog will show you how to make your own laundry detergent, save money, avoid industrial chemicals and wash your work clothes well. 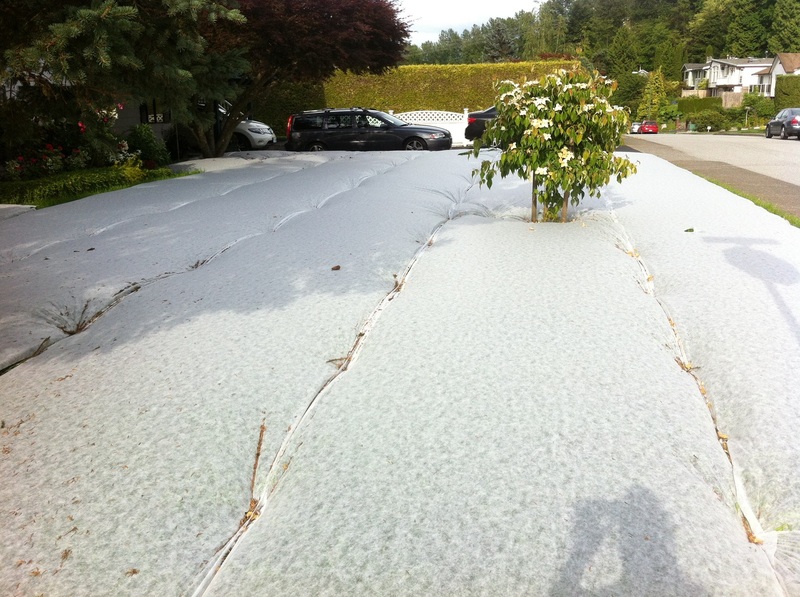 It’s a long season outside for all landscape professionals, in all kinds of weather. Clothing gets filthy and beat up. We wash it almost daily since company uniforms with logos must be worn. Follow the steps below and save money on laundry detergent for your work clothes. Credit: the idea and actual procedure comes from a book called “397 ways to save money”. I tried it out and a blog was born. Find leftover soap bars or get a third of a new bar. 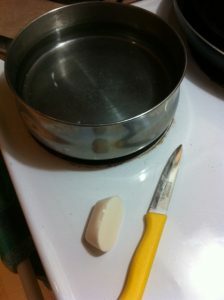 Warm up 1.5L of water and cut up the soap bar into it. The smaller the better. Gently stir until the soap melts. I use a “retired” pot to avoid unnecessary conflict with my wife. Transfer the pot contents into an 8L container. I use two 4L milk containers. Top up with warm water. Let the contents settle for 24 hours. You did it! Enjoy your new cheap detergent. 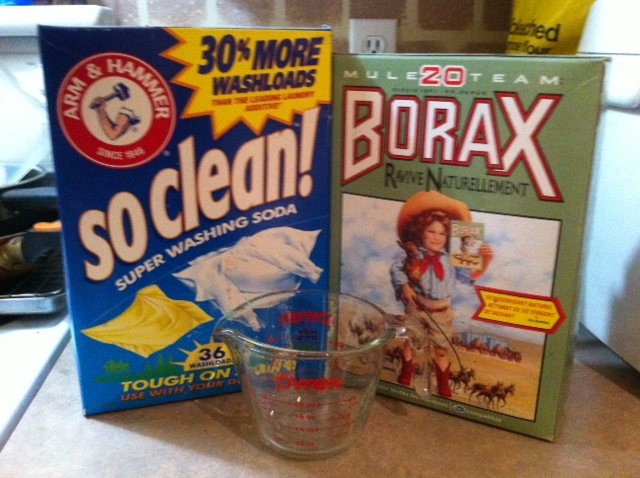 Yes, you can make your own laundry detergent, save money and avoid nasty industrial chemicals. 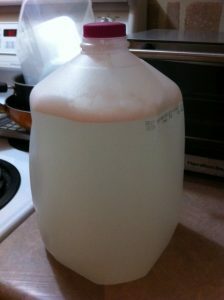 When I first told my co-workers I made my own laundry detergent on the weekend, I got puzzled looks back. Some even felt sorry for me, asked me if everything was fine at home and offered me financial help! I’m happy to report that my clothes are fine and the powder boxes make a lot of detergent. But don’t just take my word for it. Try it out and save some money. Post comments below this blog. 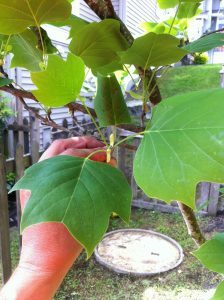 It’s early May and tulip trees are hard to miss on one of my Maple Ridge strata sites. 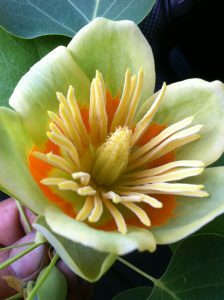 Liriodendron tulipifera (family Magnoliaceae) are eastern USA natives. 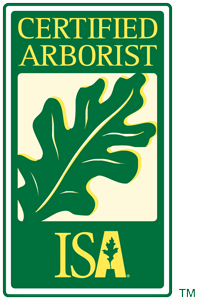 In landscapes they are used as shade or lawn trees. They are large trees and therefore need ample space. Always consider your tree’s mature size. They are fast-growing trees but weak-wooded. 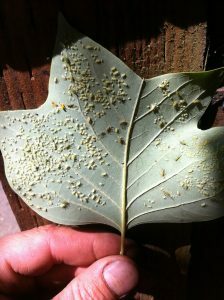 This may be part of the reason why tulip trees are not recommended for street tree use. Then there is the size issue. 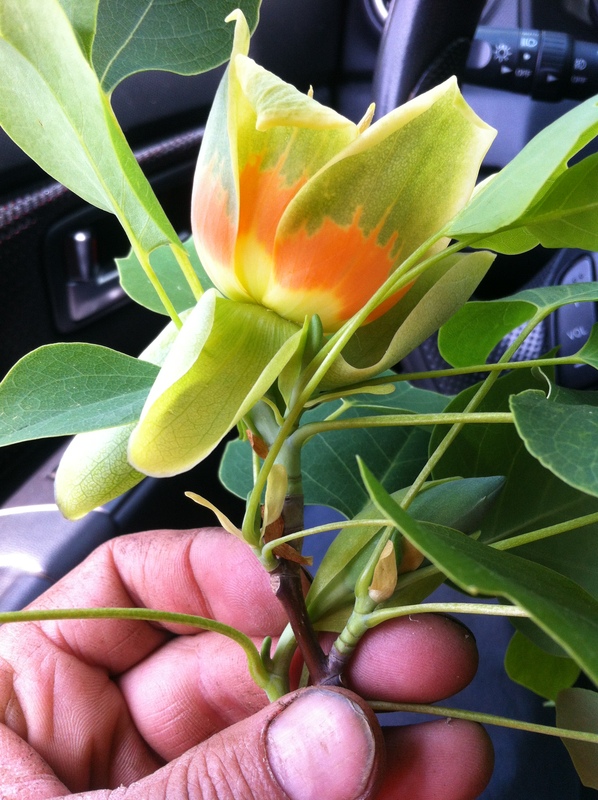 Tulip trees bloom from May to June but there is an interesting twist. 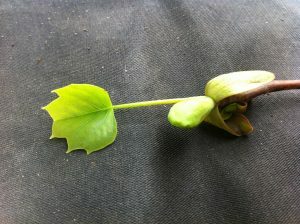 Trees usually flower and then leaf out. Cherries, for example, put on a great show, fade and then green foliage appears. Show is over. Tulip trees flower as they leaf out and since the cup-shaped tulip-like flowers are borne high in the trees, they are easy to miss. Not for me. Armed with this knowledge I was able to shoot my own flower pictures for this blog. Tulip tree leaves also have an interesting tulip-like appearance. Together with the tulip-like flowers, it makes it easy to remember the common name. But remember it’s best to learn botanical names. You will be glad you did. Sometimes I find it amusing how both leaves and flowers are tulip-like. The actual leaf-out mechanism is interesting but difficult to describe. Tulip trees like full sun and tolerate moderate drought conditions. In dry weather interior leaves turn yellow and fall off. This is a response to weather, not a disease. One annoyance with tulip trees is aphids. When aphid infestations are large lots of honeydew secretions appear on the leaves. These provide the growing medium for sooty mold fungus. Usually there is little permanent damage to the tree but it is annoying. Mrs. Tushman goes out to get her latte and the family Porsche is covered in sticky secretions. Then the world is close to ending. Tulip trees are gorgeous trees. Spot them in your neighborhoods. Plant them if you are lucky enough to have the required big spaces for it. Creeping jenny: rampant and aggressive! 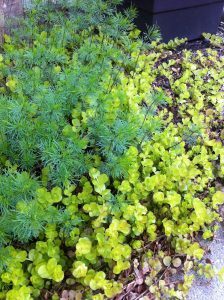 Creeping jenny (Lysimachia nummularia) is an attractive perennial groundcover. But first, allow me to begin this blog with a story. 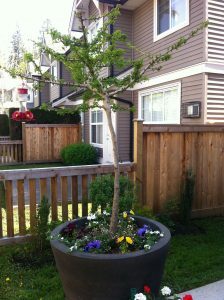 Years ago I used to maintain a Westwood Plateau site in Coquitlam, BC with a roundabout which had creeping jenny planted around the edges. One of the managers, a no-nonsense polished business guy, fussed about it almost weekly. Do we need more? Is it flowing over the curb edge too much; not enough? Don’t hurt it with your cultivators. Did the delivery dudes run it over again? Then one day I got a phone call from my boss saying the manager collapsed in his office and died. He was barely into his 40s. Brain aneurism. That was it. Gone in a flash. Now the nearly indestructible Lysimachia nummularia always reminds me of him. Lysimachia nummularia is a low-growing ground hugger, rampant, and evergreen. In summer it produces cup-shaped, bright yellow flowers. That’s when you really notice the plant. Bees will thank you for planting it in your garden. I find yellows very warm, happy colors. I have also seen creeping jenny planted in containers where it nicely spills over the edges. My own salvaged plants are doing fine in pots on the patio. 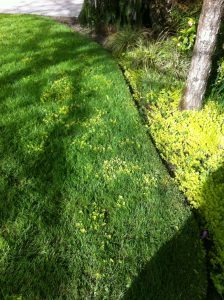 Other uses include hanging baskets and border edging; just watch the spreading habit. 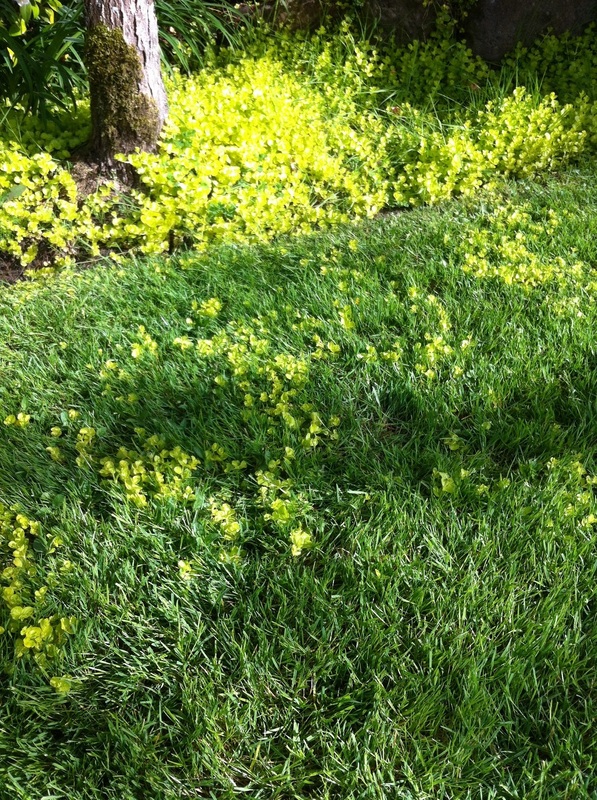 Unlike many other types of groundcovers, it can handle damper soil; it can also handle limited foot traffic. It survived numerous run-ins with delivery trucks in the above-mentioned roundabout. It prefers full sun or partial shade. Obviously, full sun will give you better looking flowers. 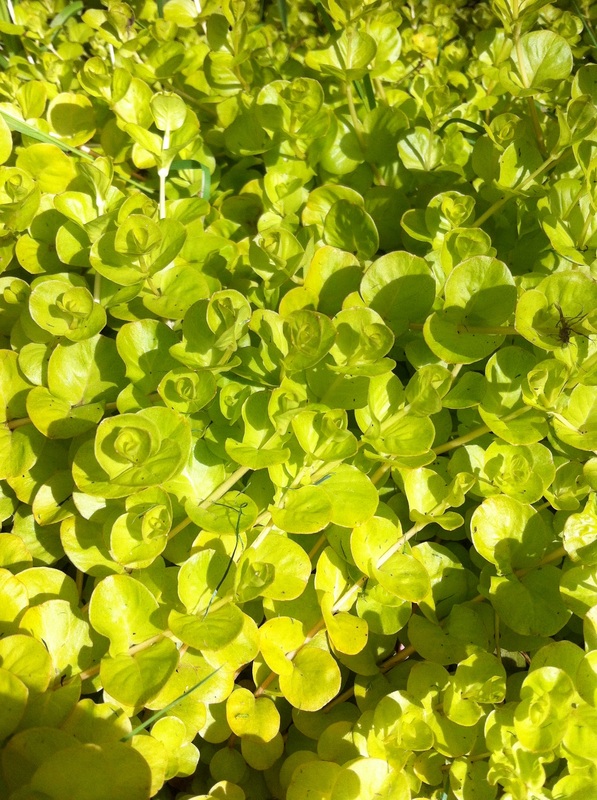 If your garden is shady, this will be a colorful groundcover plant. There are no serious diseases or insect problems to report. First, a quick flashback to 2014. Late in the day we pulled up at a seniors center and my municipal gardener boss asked us to quickly use up the flowers on the back of the truck. 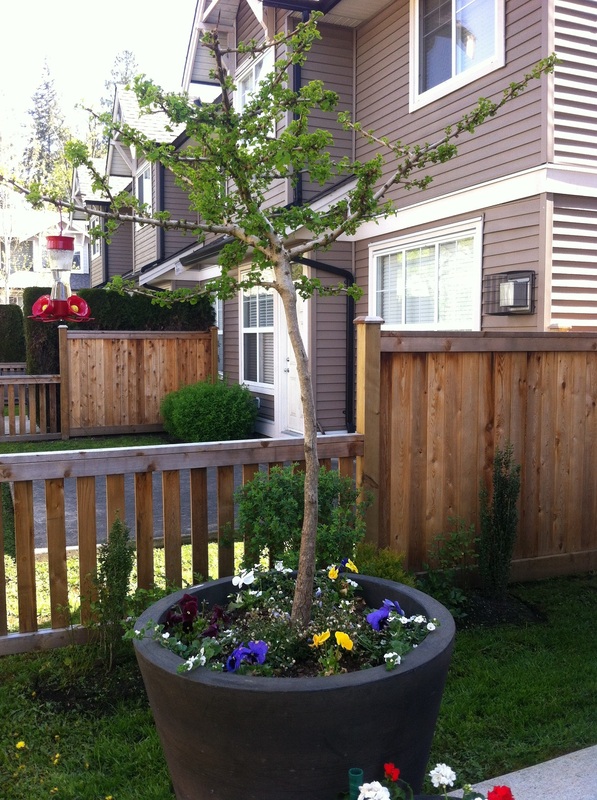 By planting four large pots. No guide, no plan. Go, go, go! I admit I panicked. How do you quickly arrange everything? Which plants go where? Colors? Oh my, I was sweating. Luckily it all turned out fine. I took a picture kneeling by “my” pot but the smile hid a ton of stress. This event popped up in my head when I opened a recent issue of Landscape Management magazine (February 2016, page 16) and saw an article on pot design. The how to article conveniently divided the planting task into three categories. The pot should have a thriller in the middle to attract attention. Spiller plants spill out over the pot edges. 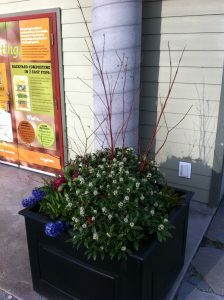 Filler plants are placed in between the thriller and spiller plants. Clearly this article was published a few years too late. I love the simplicity. Thriller, spiller, filler. Done. Now for some examples before YOU start to panic. Thriller plants could be: yuccas, cannas, fountain grasses, Angelonias, and dracaenas. For shade pots you can use ferns, hostas or heucheras. 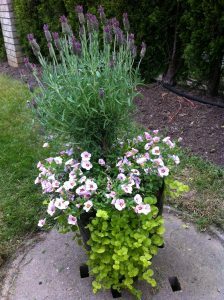 Filler plants could be most annuals. Of course, proper design considers more than plants. Don’t forget other factors like wind, sun, fertilizers, water, upkeep, deadheading and yes, theft. 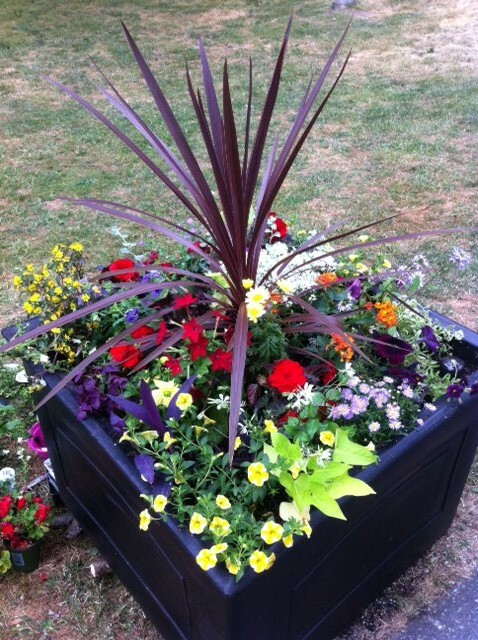 City of Coquitlam park event- my kids helped plant this pot. Don’t stress like me. Design your pots with confidence. Have some fun. Change things up. Remember the three key elements: Thriller, Spiller, and Filler. Good luck.